The pesky problem of paying for the news could be resolved rather fast if publishers and broadcasters just charged Steve Jobs a nickel a word for all the free hype they provide to sell his iParaphernalia. 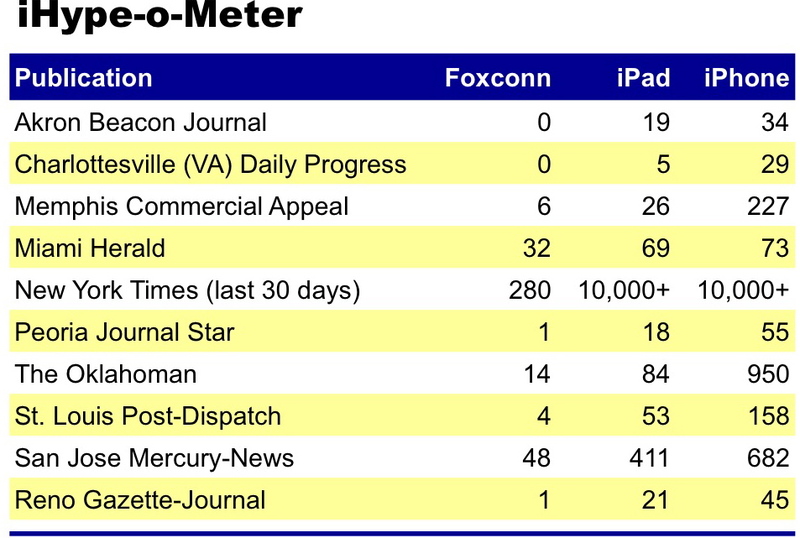 While I admit to being as fascinated as the next guy with Apple’s electronic confections, it is nonetheless staggering to see how much scarce reporting talent and news hole goes into pimping iProducts in the nation’s press. In fairness, it must be noted that not all iPad and iPhone stories are favorable, including this piece by Nicholas Kristof on the bloody provenance of some of the components in certain electronic components. Some articles talk about malfunctions in Apple products (and the miserably over-saturated AT&T network on which they attempt to operate) and a few covered the door-busting police raid that Apple encouraged on the home of a reporter who got his hands on a pre-release iPhone4 that evidently had been left in a bar by one of its engineers. Judging from a scan of the headlines (I made no effort to read the hundreds of articles), the overwhelming thrust of the coverage contributes to building advance excitement for both iGizmos and then fueling the frenzy by describing the real or stage-managed shortages that followed their release. It’s hard to think of any other company that consistently merits so much fawning coverage for doing the same thing every manufacturer does: Creating a new product, announcing it is going to come to market and then coming to market. Imagine how silly it would be if the press went nuts for weeks on end about the next-generation version of Charmin or a new incarnation of Diet Coke. Should Jobs decline to pay for all this favorable ink – as you know he would, if asked, which he won't be – the least he can do to repay the kindness of the press would be to give newspapers some badly needed tips on marketing. It would be a major iMitzvah. With newspaper share prices up some 380% in the last 12 months, even the ordinarily incisive Economist Magazine last week offered an upbeat appraisal for an industry that many had written off for dead a year ago. But it is flat wrong to believe that newspapers are on the mend in the United States. In fact, American publishers missed out on the broad advertising recovery that took place in the first three months of this year. This should trouble anyone who works at a newspaper – and everyone who values the industry’s singular capability, when it is on its game, to enlighten our democracy. 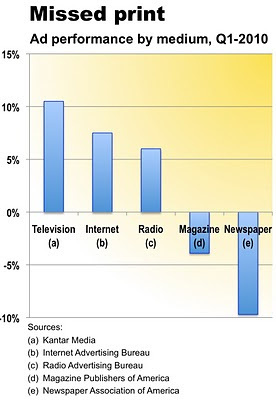 As illustrated in the chart at left, newspaper and magazine sales in the first quarter dropped respectively 9.7% and 3.9% at the same time television expenditures advanced 10.5%, Internet rose 7.5% and radio gained 6.0%. 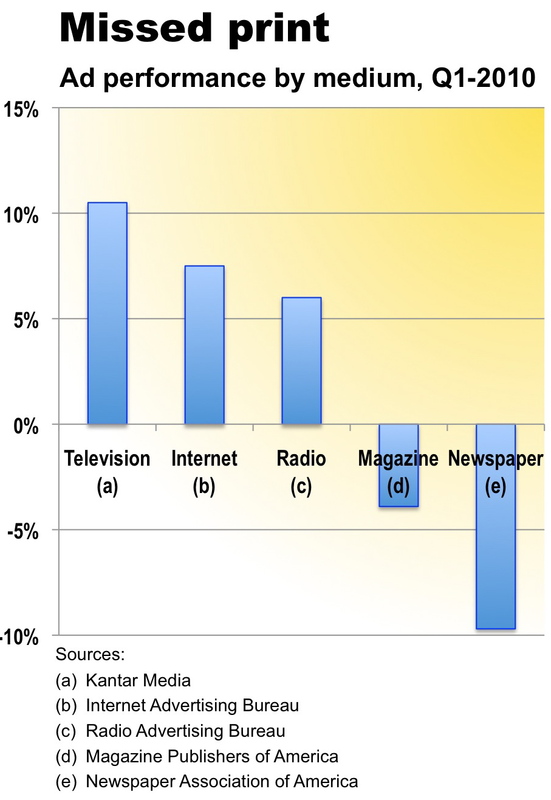 The ongoing contraction in newspaper advertising – coming on top of a 40% sales skid in the two years ended on Dec. 31, 2009 – adds further support to the thesis that the industry is suffering from major structural changes in the media market that will not reverse fully in even the best of economic circumstances. The secular shift away from newspaper advertising is illustrated vividly in what happened in the early months of the year in the automotive category, where year-over-year vehicle sales grew by 17.2% through May after a sluggish start in January and February. While manufacturers and dealers on average increased their ad budgets by 18.6% in the first quarter of the year, automotive classified at newspapers fell 16.0% in the same period. The over-all market data is from Kantar Media, the ad-tracking company formerly known as TNS. The newspaper data is from the Newspaper Association of America. :: Although the U.S. Census Bureau reported that retail sales were up 6.3% nationwide in the first three months of the year, advertising in the single most significant newspaper category was down 11.2% in the period. :: Although the National Association of Realtors reported that contracts to sell existing homes were up 21.1% at the end of March, real estate ad revenues at papers were down 27.3% in the first quarter of the year. The only positive growth posted by newspapers in the first period of 2010 – which also happened to be the first advance in any category in 24 months – was an increase of 4.9% in online advertising. But this pales in comparison to the over-all industry improvement of 7.5% in the same period, suggesting that newspapers are continuing to lose ground in even the vital interactive marketplace. With advertisers for the most part stepping up their schedules in the hopes of grabbing greater share for their businesses as the economy inches toward recovery, the above trends suggest marketers may well have learned to do without newspapers during the long recession. Seeking to save money while building visibility for their brands, many marketers experimented during the downturn with such targeted and less expensive media as cable TV, online classified sites and niche print publications. Of course, many also learned that some of the most productive online environments – such as employer-operated job sites and Craig’s List – are downright free. Now that the economy has improved, they see no reason to rush back to newspapers, where ad prices are high and audience response ordinarily cannot be quantified as easily as it can on Google Analytics (which also happens to be free). 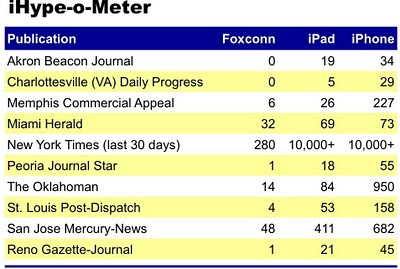 By not keeping pace with the turnaround, newspapers will continue to lose ground they can ill afford to lose. The industry’s $5.2 billion in combined sales in the first quarter of this year were less than half the volume achieved as recently as the comparable period in 2005. A revenue collapse of this magnitude would be sufficiently catastrophic for any industry. But it gets worse. In addition to a formidable revenue challenge, newspapers are facing a soon-to-accelerate erosion of their reader base as their superannuated audience ages inexorably toward extinction. Half or more of the circulation at most newspapers is composed of individuals who are aged 50 and older. This concentration means that newspapers on average have twice as many senior readers as exist in the population as a whole – and that, by logical extension, they are not engaging the younger readers that they must attract for a prosperous future. While newspaper publishers have been able to boost the battered profitability and beleaguered share prices of their companies by cutting deeply into headcount and news hole, these short-term expedients are no substitute for forward-looking strategies to create innovative print and digital products to revitalize their audiences and attract fresh ad dollars. No business ever cut its way to success. Newspapers won’t either. Now that we have bought all those expensive iPads – and we know who all of you early adopters are, too – what are we going to do with them? Here’s the first in an occasional look at what’s hot – and not – in App-Land. Safari has been named the best app for the iPad by several commentators and I couldn’t agree more. The snappy (unless it’s on the ATT network) web browser makes it possible to access a beautiful rendition of any site on the web, including those operated by publishers offering sub-par iPad apps (see below: Time Magazine and the New York Times). This app fully exercises the multimedia capabilities of the new medium with words, pictures and video. It is attractive, well organized and world class, given that it is offered in French, English and Arabic. Runners up: BBC (which offers a live audio stream) and NPR (which doesn’t). This is nothing more than a collection of captivating pictures evoking scarce intellectual heft (see left), but it has lots of potential to build and monetize an audience. The newly released app features prominent opportunities to share pictures with friends, making it catnip for the social media. It is being monetized cleverly by embedding a movie trailer, an approach that could be used to sell all manner of other products. This is simply a page-by-page representation of the paper but it is a very satisfying experience because pages can be opened, expanded and navigated rapidly and smoothly on the iPad. Nothing fancy. But it works. Books are more pleasant to read on the iPad than any other e-reader, so long as you are doing so under exactingly perfect lighting conditions, which is to say away from sun and glare. If you find yourself properly situated, the only other challenge you’ll confront when facing the highly polished iPad screen is finding something to read in the entirely too tiny iBooks catalogue. No one is going to pay $4.95 a week for something you can get for free at www.time.com. Save your shekels and read the mag on Safari. The might of the New York Times is the depth and breadth of its content. Why would anyone fiddle around with an app that barely scratches the surface of a day’s coverage? It’s easier to go to the website. If you want to try something completely different, I hear they have a print version, too. This is the promo site for a cinematic bomb about a long-in-the-tooth secret agent called upon to defuse a nuclear device. The app has all the right ideas: Sound bites, still photos, a game, a trailer and more. But no amount of technical wizardry could save this effort from the sophomoric subject matter at hand. No discussion of killer apps would be complete without discussing the biggest app killer of them all: The balky, sluggish and unreliable ATT network. If you don’t want to be tempted to stomp your expensive new toy to death, stick with the wi-fi version. This is the latest in a series of Newsosaur posts providing publishers with actionable revenue and content strategies for the tablet iPad. Prior articles packaged in a convenient 10-page PDF are available here for immediate download for $1.99. Proceeds will be used to buy more apps to pick on. The secret to innovation: Aim! Ready! Fire! Springtime seems to have brought a refreshing zeal for innovation to the nation’s battered newspapers. And, not a moment too soon, given the 27% drop in advertising sales in 2009. But, as I learned in my decades of running and financing start-up businesses, it takes more than desire to successfully bring new products and services to market. Product innovation requires discipline and methods that are not common at the typical newspaper company. Aim. First and foremost, identify the audience and revenue streams you want to reach. Then, and only then, think about what products to build and the appropriate platforms (print, web, mobile, tablet, blimp, etc.) on which to deliver them. This approach differs from the common mistake at many papers of building products and searching for markets for them as an afterthought. In the worst cases, papers build products but neglect to market them altogether. The lack of success likely to attend un-marketed or under-marketed products has the unfortunate side effect of blunting organizational enthusiasm for future innovative undertakings. This would not be a good outcome at a time newspapers need to be more creative than ever to attract fresh audiences and revenues. Ready. Once you have identified a potential audience, revenue stream and product, it’s time to do your homework by building a detailed and hard-nosed business plan that includes, but is not limited to, an objective economic and demographic evaluation of the potential market; a bottoms-up revenue projection; a thorough cost analysis, and a comprehensive plan to take the product to market. After completing your homework, you will know who in the organization has to do what, when they have to do it and – most importantly – how much it is going to cost. If this exercise shows the idea to be too complicated or costly to be worth the trouble, then this is the golden moment to abort the mission. If you go forward, the shared expectations provided by a well-conceived business plan should assure reasonably smooth execution. It also should avert embarrassing discussions about unanticipated cost overruns. Fire. This is the phase when you take a prototype product to market to test its appeal so you can tweak the offering to optimize customer acceptance. Many newspapers stumble at this juncture, because they spend too much time and money trying to build a perfect product. While perfection may be the ultimate goal, the launch (or beta) version of a product only has to be “good enough” to prove, or disprove, the concept. If the product catches on, you’ll have time to add all the bells and whistles you want. But there’s no reason to waste valuable time and resources on something you might have to junk. So, don’t get fancy. Speed the product to market, objectively gather consumer input and refine the product as necessary. Once you have an honest assessment of its capability, either fill it with snazzy new features and a beefed-up marketing budget – or kill it if it doesn’t fly. While failure is not the hoped-for goal, it is an option. Far more Silicon Valley start-ups flop than become the next Netscape, Silicon Graphics or Friendster. Come to think of it, we haven’t heard much lately from those once-big names. You can enhance your chances of success by systematically developing and launching a product aimed at a carefully identified market. If your first innovative venture doesn’t succeed, however, do an honest after-action assessment of your mistakes and try, try, try again. Fed up with furloughs and down-sizing – or forced involuntarily out of their jobs – journalists across the land are taking matters into their own hands by starting their own news sites. While I applaud these brave and commendable efforts, I fear a good many journalistic entrepreneurs are doomed to fail because they are not objectively confronting the steep odds they face – or putting nearly enough thought and effort into giving themselves a fighting chance to succeed. After talking to one enterprising journalist after another, I have found almost uniformly that they are making the mistake that has proven to be the downfall of many an entrepreneur: Instead of trying to build a business, they are trying to give themselves the job they always wanted. The passion for the product they are creating causes entrepreneurs to work so hard on their journalism that it distracts them from the real job of building an enterprise that not only sustains itself for the good of the community but also provides a sustainable lifestyle for the journalist himself. In an effort to calibrate the daunting, come-from-behind challenge faced by virtually every journalism start-up, I decided to compare the traffic of three recently launched news sites with the online audience of the incumbent newspaper in each of the markets they serve. The newbie journalism sites generate such low traffic that they fall below the radar of many rating services. But Alexa.Com ranks websites through a proprietary formula that takes into account unique visitors and page views. This system, though not 100% transparent, makes it possible to gauge the relative size of one website to another. In the Alexa system, where Google ranks No. 1 for having the most traffic, the rural journalism start-up, which has been in business for more than a year, ranks at about 17,000,000 vs. 350,000 for the site of the dominant newspaper in the market. The metro start-up, which is about half a year old, ranks about 174,000 vs. 640 for the incumbent local daily. The statewide start-up is 1,300,000 vs. 2,100 for the primary paper in the market. With all the brand power, market presence and resources at their command, many newspapers struggle to extract full value from the investment they have made in their websites. So, you can imagine the challenge faced by a small, essentially unknown start-up with limited staff and financial wherewithal – especially when their focus is on journalism, instead of business. While journalists at news start-ups think nothing of routinely devoting more than a dozen hours a day to running down stories and tweaking their websites, the pace typically leaves them with neither the time nor the energy to think about such key success factors as building audience and developing a healthy financial basis for their endeavors. These issues ought to be Job One for any start-up, regardless of whether it intends to operate as a for-profit or non-profit venture. But they usually take second place, if they are seriously in the running at all. Although the sound bites fairly cover the possibilities for achieving ongoing viability, conversations with most operators quickly reveal that they actually have no concrete plans for pursuing them. The journalists are so busy being journalists – and, frankly, too confident that the quality of their coverage will be sufficiently compelling to attract an ever-growing audience – that they put scant effort into marketing, promoting and monetizing their sites. A clever bit of programming has provided a visual aid to illustrate the unfathomable damage being caused by the 880-fathom-deep gusher pumping untold gallons of oil into the Gulf of Mexico. This visual aid is a customizable Google Map at a website called IfItWasMyHome.Com, which makes it possible to superimpose the latest known contours of the BP oil spill over any location in the world. As you can see from the screenshot below, data from the National Oceanic and Atmospheric Administration currently shows the goo to be covering an area equivalent to the space bounded by New Hampshire, Massachusetts, Connecticut and New York State. The map was put together in an evening by Andy Linter, a software developer in Royal Oak, MI, who welcomes anyone to go to his site, move the spill over the geography of your choosing and then publish a screenshot of the result. It wasn’t long before the map started making its way around the Internet. Would that BP had someone as clever as Andy Linter to cap its runaway well. Assuming the fare produced by Associated Content is sufficiently respectable to attract and retain substantial audiences, then Yahoo’s ability to deliver targeted ads – combined with its overwhelming market presence on the web – will give it significant advantages against the incumbent newspapers operating in most markets. As one of the largest and oldest portals on the web, Yahoo knows at least a little something about almost everyone who ever has gone on line. In fact, it knows lots more than a little something about most of us. Using that information, Yahoo can target advertising not only to a person’s location but also to her demonstrated online behavior. Publishers know the extent of Yahoo’s power only too well, inasmuch as some 800 of them partnered with the company through the Newspaper Consortium in the last few years to sell targeted advertising that enabled them to charge as much as $15 per thousand page views for banner ads that, absent targeting, might have gone for maybe a buck or two per thousand. The concept is described below in a YouTube video posted by the Peoria Journal Star, one of the affiliates of the consortium. To date, the publishers who took full advantage of Yahoo’s targeted audience data were able to generate handsome improvements in their online sales. Yahoo, in turn, benefited not only by having access to abundant ad inventory on high-traffic local websites but also by leveraging the thousands of well-connected ad sales people fielded by the hundreds of participating publishers. The nature of this mutually beneficial relationship could change – not necessarily for the better for newspapers – if Yahoo starts running local news sites of its own. After mustering the Associated Content crew to produce local stories at far lower cost than any newspaper, Yahoo can use its vast reach on the web to point users to its own websites. As one of the five largest destinations on the web, Yahoo’s traffic of some 70 billion page views a month is more than 100 times greater than of NYTimes.Com, the busiest newspaper website of all. If publishers let their reps sell advertising for Yahoo’s local sites, the newspapers potentially can tap into a welcome new revenue stream for themselves. In so doing, however, the publishers face the danger that a great deal of the traffic now attracted to their own sites could be diverted to Yahoo, instead. With digital media being the future for local newspaper franchises, strengthening Yahoo’s hand as a competitor for online and mobile local news would be strategically suicidal for newspapers. Even if publishers decide their short-term economic interest requires them to continue selling ads for Yahoo, the nature of this relationship could be strained, if not changed. With Yahoo having the power to produce and promote local sites on its own, the balance of power in the current, reasonably symmetrical partnership will shift to Yahoo. Where will that put consortium members? Will Yahoo demand a larger revenue share from publishers in exchange for access to its targeted audience data? Or will Yahoo simply terminate the relationship with publishers so it can engage alternate sales agents to pursue the local news business? Assuming Yahoo and the publishers find a basis for sustaining their partnership, newspapers in the consortium will be in the position of being deeply beholden to the portal for the technology necessary to remain competitive in the increasingly important realm of targeted advertising. Publishers in the consortium conceded too much when they elected a few years back to outsource the development of this sort of strategically decisive technology to Yahoo instead of getting together – as they could have done – to build it themselves. Now, those decisions may come back to bite them. Newspapers that are not members of the consortium could be even worse off than those who partnered with Yahoo. In the event of a competitive thrust by Yahoo into their markets, they could be dangerously ill prepared and frighteningly over-matched.